The Department of Defense's Base Closure and Realignment Commission (BRAC) plans to close 20 military bases across the country by Sept. 15, 2011. Once a military facility closes, the ripple effect is felt throughout the surrounding communities: families lose neighbors, businesses lose customers and workers lose jobs.In this series of stories,DailyFinance looks at how closures have affected communities in the past, and at what some military families and the businesses that cater to them plan to do once their base closes. Located less than five miles from the Canadian border, the small town of Limestone, Maine, is home to roughly 2,000 people, most of whom work in agriculture, forestry or at one of a handful of new businesses that now call the town home. In the words of local resident Carl Flora, Limestone -- and the rest of Aroostook County -- "has always had a reputation for pulling together. We realize that, if we are going to survive, we need to work together." That sense of community was put to the test on Sept. 30, 1994, when nearby Loring Air Force Base closed. 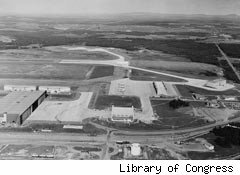 One of America's closest bases to the Soviet Union, it was the second-largest airfield in the Strategic Air Command and a central part of Cold War strategy. By 1991, more than 4,500 active-duty military personnel were stationed at Loring. Including families, it was home to more than 9,000 people. It also employed over 1,000 civilian workers from the surrounding area. With the fall of the Iron Curtain, Loring lost its strategic importance, and in 1991, the Department of Defense selected it for the second round of major BRAC cuts. Over the following months, other federal agencies stepped in, seizing parts of the base for a variety of uses. The Fisheries and Wildlife Service took control of 4,700 acres, which it designated as a wildlife refuge. At the same time, the military decided to locate one of its Defense Finance and Accounting Service (DFAS) offices on the former base. Nearby, the U.S. Department of Labor installed a Job Corps center, where it prepared teenagers for careers in culinary arts, medical support and other growth industries. The DFAS office and the Job Corps center created clerical and support jobs for several hundred local workers, but Loring's closure still decimated the local community. Between 1990 and 2000, Limestone's population fell from almost 10,000 to just over 2,000, a 76% drop. According to the Maine state planning office, 19% of the regional economy was related to Loring. The base's closure left a large hole in it -- and in the community. Many former bases, especially in rural areas, become home to federal penitentiaries. Loring briefly considered this option: "At the time, there was a need for military prisons," Flora remembers, "But, bottom line, we're not a prison community, and there was some reluctance to convert our community to a prison culture." When the military decided against building a lockup at Loring, the base's planners weren't disappointed: "I don't think that anyone on my board felt that we missed out," says Flora. A Venue for New Businesses -- and Phish Concerts? In the 16 years since the closure, the Loring Development Authority (LDA) has brought in 1,400 jobs, more than replacing the civilian jobs on the base. Today, the base has several tenants, including a refurbishment business that cleans and repairs military armaments and vehicles, a Sitel call center housing outsourced customer-service representatives and a factory for Hydroblend, a food company. In addition, an aviation company, SAIC, is developing an unmanned blimp on the base, and Bigelow Aerospace has a small satellite tracking station there. The LDA has also found some creative uses for Loring. As Flora, the authority's president and CEO, notes, "There are very few places where you can have a wide-open area with the infrastructure and support structures to handle tens of thousands of people. Loring is one of them." 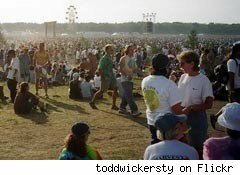 This was part of the attraction in 1997, when Phish, the folk-rock band, decided to hold an outdoor festival at Loring. Almost 70,000 people camped out on the runway and airfield, briefly transforming the former base into the second-largest city in Maine. They returned in 1998 and 2003 (the 1998 show is pictured left). Since then, Loring has also become a site for land-speed racing events, whose participants use its huge runway for timing trials. Still, Limestone continues to mourn the closure. As Flora notes, "I think that we may have stopped the bleeding, but we have a ways to go before we negate the loss of Loring." Will Military Base Closures Mortally Wound Local Real Estate Markets?